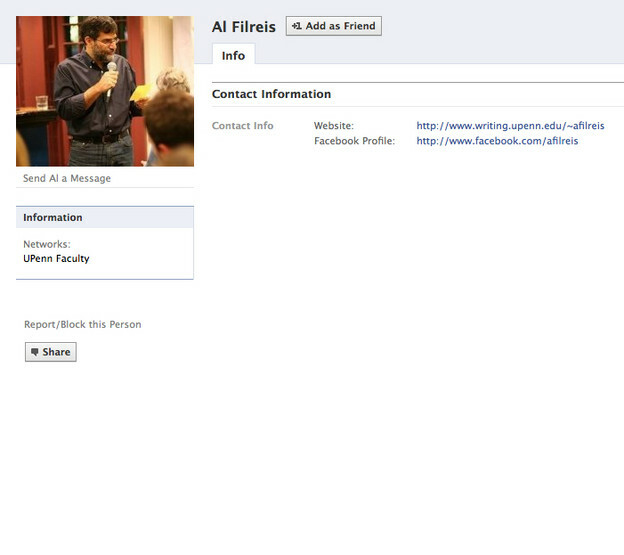 My Facebook page as it appears to those who are not my friends. This week the “Slate Culture Gabfest” (a podcast I always listen to) did a segment on Facebook privacy. I hadn’t realized the extent of anxieties out there. True, one doesn’t want the entire world (“everyone,” in Facebook parlance; or “friends of friends,” which for me is almost everyone) seeing your photos, very much at all of your “bio” information, your status updates. So what’s the big deal? Click “Account” at the top right, then click “Privacy Settings,” and generally select “Friends only” for everything. You’re done. Below is a screenshot of what people other than my approved “Friends” can see of me. Now do it or stop complaining or delete your Facebook account. I don’t like Facebook's top-down tell-us-afterwards style of management, but there are a lot of things I don’t like about Web 2.0. So I adjust or decline. Opt out is the phrase.